President Russell M. Nelson addressed members of The Church of Jesus Christ of Latter-day Saints — over 16 million members — four separate times during the 188th Semiannual General Conference Oct. 6 and 7. Throughout his time at the podium, President Nelson announced 12 new temples, introduced a “home-centered” plan which includes two-hour church blocks, affirmed women’s importance in the church, clarified name changes and clearly and simply expressed God’s encompassing love for all his children. President Nelson said Latter-day Saints have become comfortable associating church with designated Sunday meetings, simply supported by home life. “We need an adjustment to this pattern,” he said. President Nelson affirmed that in this day and age, fortifying families from within the home is important. Adverse forces are deepening their attack on faith and families, he said. “We need counter-strategies and proactive plans,” President Nelson said. Threat to families is what prompted the organizational adjustments, according to President Nelson. “Our efforts over these recent years to hallow the Sabbath — to make it a delight and a personal sign to God of our love for him — will be augmented by the adjustments we will now introduce,” he said. Elder Quentin L. Cook of the Quorum of the Twelve Apostles then took to the podium to announce a new curriculum designed to build up families through the combination of both home and church. One way the duel curriculum will be implemented is in the instatement of two-hour church, which will take effect in January, Elder Cook said. The announcement was met with a flurry of commotion both within the Conference Center and via social media. Church Sunday services have been composed of three-hour blocks since 1980. Saturday morning’s announcement was a first in church history. Later, Saturday evening, President Nelson spoke specifically to the women in the church imploring the sisters to consider their spiritual gifts and “shape the future” by carrying out four invitations: Participate in a 10-day social media fast, read the Book of Mormon before the close of 2018, increase temple attendance and increase immersion in the Relief Society. 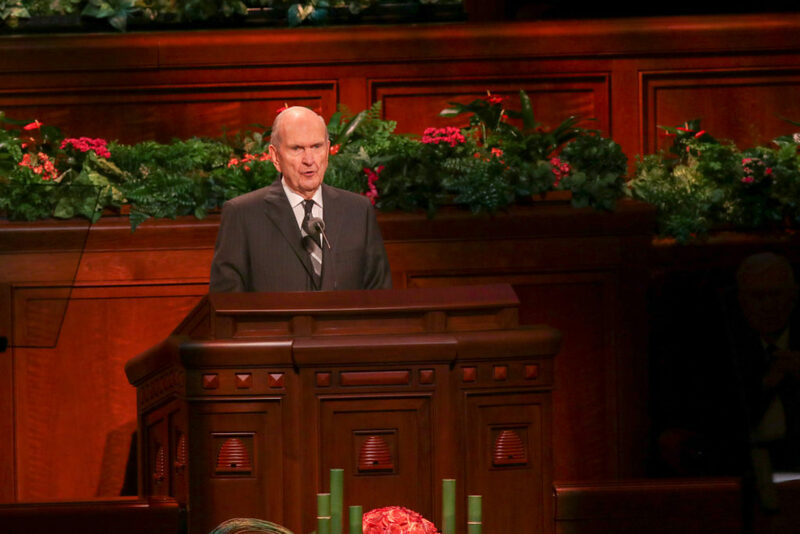 Before launching into the body of his talk, President Nelson emphasized that when he says “mother,” he isn’t solely referring to women who adopt or give birth. Nor, he added, can anyone fully emulate a mother’s influence. President Nelson asked the women of the church to use their gifts to change the world and “shape the future” by reassembling scattered Israel. On Aug. 16, President Nelson said he received revelation about The Church of Jesus Christ of Latter-day Saints’ title and various nicknames. The church released a detailed style guide with several clarifications, but President Nelson had yet to publicly address the change, which prompted comments by members and media outlets. On Sunday morning he untangled some of the confusions and addressed the matter directly saying he felt “compelled” to talk about it. The change, President Nelson said, is not inconsequential nor a human matter of re-branding, cosmetic or a wild whim — if it were, perhaps arguments against the change would be sound. The Lord’s way is not, nor will it ever, be second to man’s reasoning. “Let me explain why we care so deeply about this issue,” he said. Common place nicknames like “LDS Church,” the “Church of the Latter-day Saints” and “Mormon Church” are inaccurate because they don’t use Christ’s name, President Nelson said. Omitting his name removes him from our lives focal point, President Nelson said. In his final address, and also consequently General Conference’s concluding talk, President Nelson announced 12 new temples. Ten of which are to be built outside of the United States. His words were met with applause and several jubilant cheers which passed through the Conference Center, bringing a smile to President Nelson’s face. “I promise you that the Lord will bring the miracles he knows you need as you make sacrifices to serve and worship in his temples,” he said. The upcoming construction will take place in Mendoza, Argentina; Salvador, Brazil; Yuba City, California; Phnom Penh, Cambodia; Praia, Cape Verde; Yigo, Guam; Puebla, Mexico; Auckland, New Zealand; Lagos, Nigeria; Davao, Philippines; San Juan, Puerto Rico; and Washington County, Utah. In addition to the new buildings, President Nelson said the Salt Lake and several other pioneer-generation temples will be renovated and updated. President Nelson concluded the 188th Semiannual General Conference with several promises. 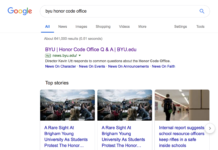 He said if members are rigorous in adapting The Church of Jesus Christ of Latter-day Saints’ correct name, they will be bestowed with greater faith and spiritual prowess. Likewise, if families and individuals remodel their homes to cultivate gospel learning, Sundays will be transformative and good. “We look to the future with enthusiasm. We have been motivated to do better and to be better,” President Nelson said. is BYU's current metro editor studying a mix of journalism and political science. 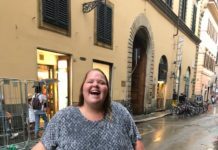 Her favorite pass times range from thrifting, scouring the internet for cheap flights without purchasing means and dreaming of someday walking around New York City with a beagle named Hamilton.